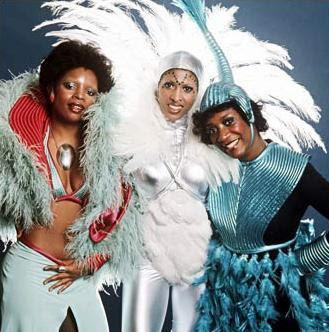 As the ‘70s dawned, Patti LaBelle, Nona Hendryx and Sarah Dash transformed themselves from a prim, gown-wearing, ballad-singing girl group (the Bluebelles) into a glammed-out, rocked-up trio of sonic adventurers (Labelle, with a lower case “b”) who cut a new template for R&B. “Lady Marmalade” was Labelle’s signature hit, but it was the group’s live performances that set a new standard for rock and funk theatricality. Labelle broke up in 1977, leaving behind a legacy of genre-bending boldness that influenced everything from disco to new wave, and can still be heard in the work of artists such as Santogold, Christina Aguilera and Prince. Now they’re back with their first album in three decades, “Back to Now” (Verve), and a reunion tour that brings them to the Chicago Theatre on Saturday. Dash says the group has toned down some of its futuristic flamboyance in favor of a more refined “upscale” look. Gone are the days of space-invader wings, bucket-shaped hairstyles and stack heels. After the group splintered, LaBelle established a powerhouse solo career, Hendryx worked with Talking Heads, Prince and Peter Gabriel while buffing up her reputation as one of R&B’s most consistently provocative songwriters, and Dash added her trademark harmonies to disco hits and the Rolling Stones alike. The group did one-off reunions over the years, and the pace picked up when Hendryx wrote a tribute to civil-rights pioneer Rosa Parks, “Dear Rosa,” a few years ago. The trio got together in the studio to record the song, and found their trademark vocal blend remained as spirited as ever. Kenny Gamble and Leon Huff, the famed Philadelphia soul producers, pitched in on a few tracks, and will.i.am added dubious modern production touches (including Auto-Tune vocal modulations) to “Rollout.” One thing will.i.am got right was recording LaBelle, Hendryx and Dash harmonizing together while sitting on the couch in the recording studio. Among the album’s surprises is a remixed live version of Cole Porter’s “Miss Otis Regrets,” recorded on the group’s first tour in 1970 with the Who’s Keith Moon on drums. Dash says the group dynamic has changed, with each singer established in solo ventures and each having her own manager. “Naturally, there are egos,” she says. Designer Larry LeGaspi's original and out of this world clothing designs helped put Labelle at the Metropolitan Opera House for the #wearsomethingsilver groundbreaking concert in March 1975, and on the cover of Rolling Stone Magazine, the first time a black vocal group graced it's cover.